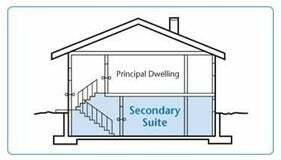 Secondary Suite* means development consisting of a Dwelling located within, and Accessory to, a structure in which the principal use is Single Detached Housing. A Secondary Suite has cooking facilities, food preparation, sleeping and Secondary Suitesanitary facilities which are physically separate from those of the principal Dwelling within the structure. 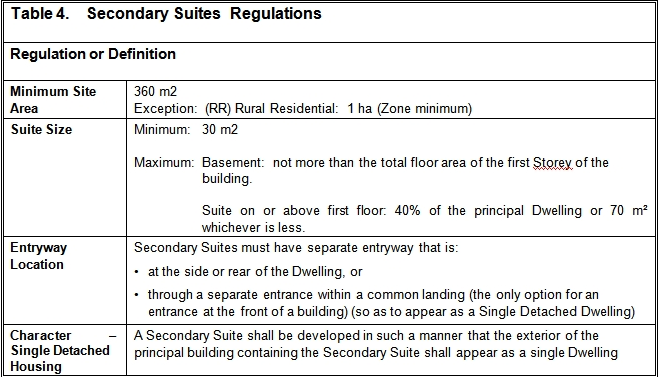 A Secondary Suite also has an entrance separate from the entrance to the principal Dwelling, either from a common indoor landing or directly from the side or rear of the structure. This Use Class includes the Development or Conversion of Basement space or above-grade space to a separate Dwelling, or the addition of new floor space for a Secondary Suite to an existing Single Detached Dwelling. 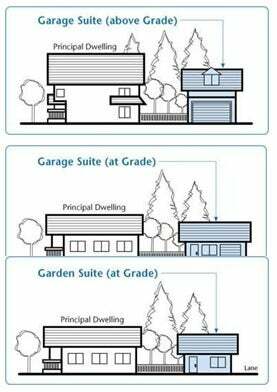 Garage Suite* means an Accessory Dwelling located above a detached Garage (above Grade); or a single-storey Accessory Dwelling attached to the side or rear of, a detached Garage (at Grade). A Garage Suite is Accessory to a building in which the principal Use is Single Detached Housing. A Garage Suite has cooking facilities, food preparation, sleeping and sanitary facilities which are separate from those of the principal Dwelling located on the Site. A Garage Suite has an entrance separate from the vehicle entrance to the detached Garage, either from a common indoor landing or directly from the exterior of the structure. 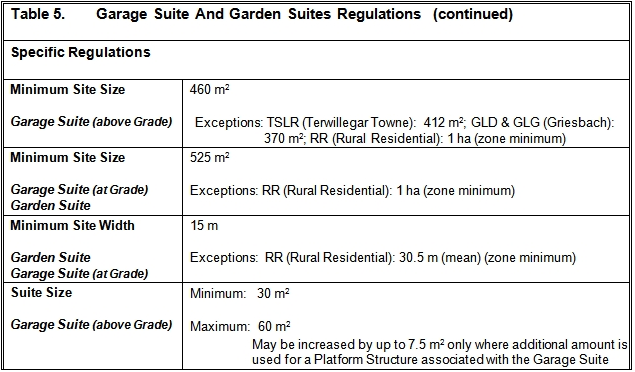 This Use Class does not include Secondary Suites or Garden Suites. 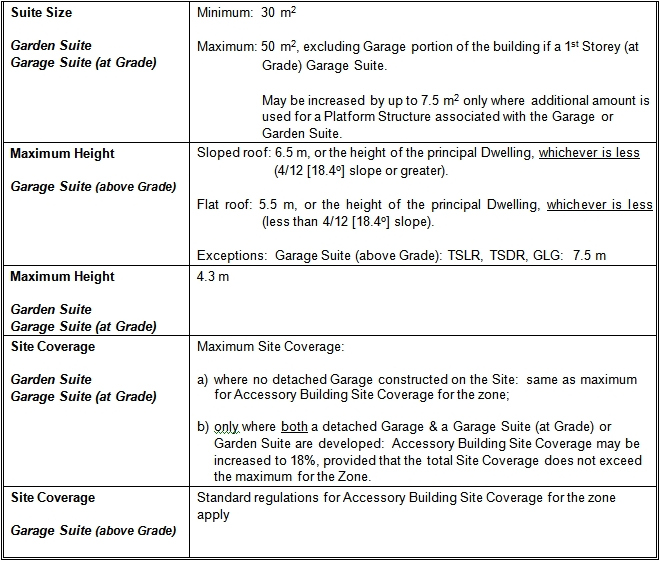 *Note: Secondary Suites are allowed only as Accessory Dwellings within a Single Detached Dwelling. 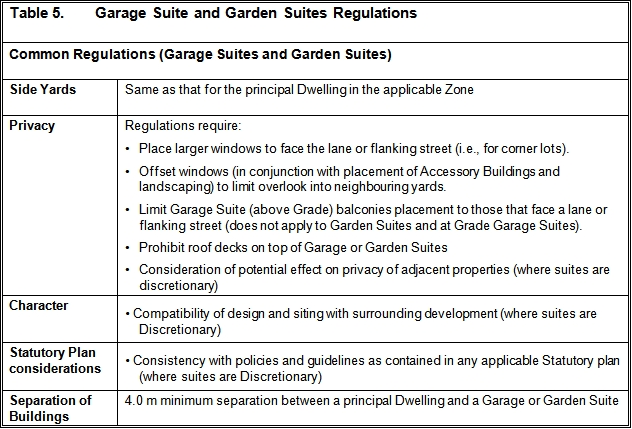 Garage and Garden Suites are allowed only as Accessory Dwellings on a Site with a Single Detached Dwelling. Secondary, Garage and Garden Suites are not allowed as Accessory Dwellings to a Semidetached (side-by-side duplex) or Row House (townhouse) Dwelling. 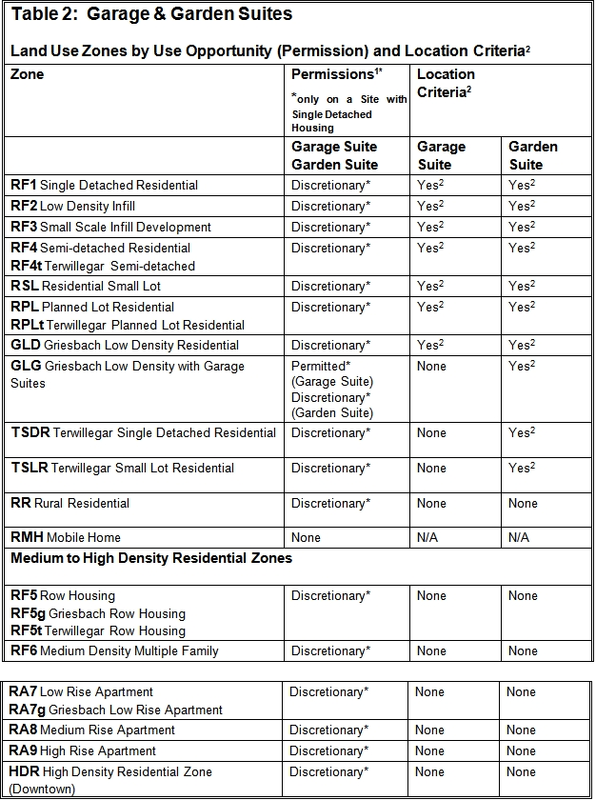 Not more than one of a Secondary, Garage or Garden Suite are allowed in conjunction with a Single Detached Dwelling. Use Opportunity and Regulations as amended by Bylaws 14750 (Dec. 12, 2007) and 15036 (Feb. 2, 2009). 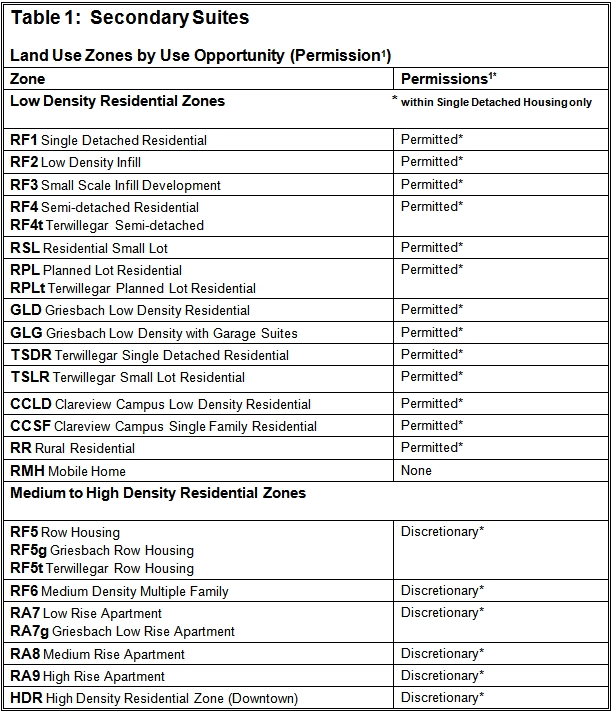 Permitted Uses will be approved by the Development Authority, provided that the Use meets all provisions of the Zoning Bylaw. No notification of adjacent landowners is required. Discretionary Uses are Uses that may be approved by the Development Authority. They require notification of adjacent landowners and are subject to appeal by the applicant or affected party. Permitted and Discretionary Uses. See Note 1 under Table 1. 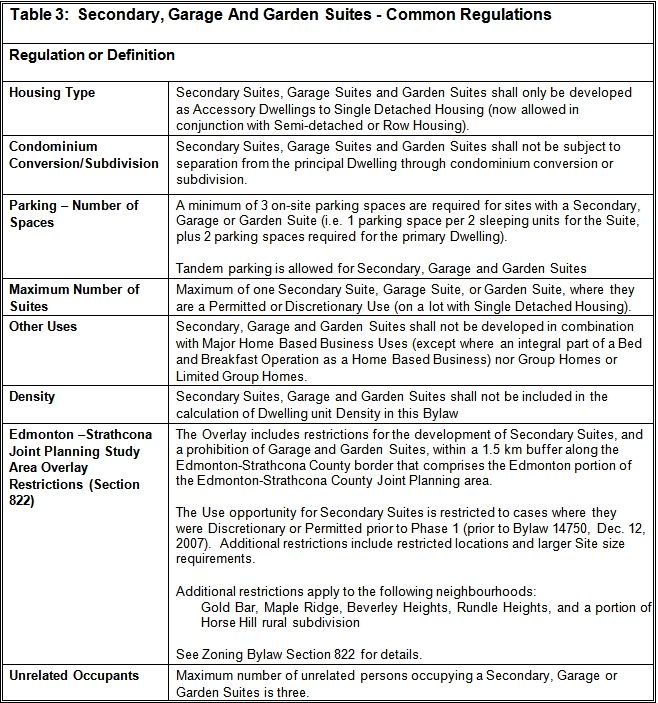 Location restrictions apply to Garage Suites and Garden Suites, depending on the zone. 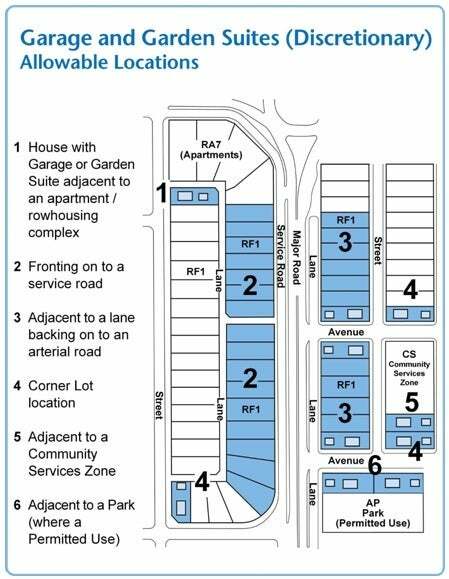 iii) any Site in a Zone where Public Parks are a Permitted Use (#6 on graphic); or is not separated from these Sites by a public roadway more than 10.0 m wide.